After a massive hit like Geetha Govindam, Vijay Devarakonda is all set to test his luck with NOTA which is a bilingual. Anand Shankar directed the political drama and the theatrical trailer of the film has been out today. The trailer promises a thrilling ride which is laced with a powerful political drama. 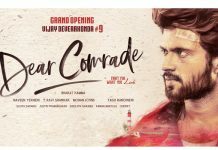 Vijay Devarakonda struggles to stand as a Chief Minister between the evil politicians throughout. NOTA discusses about the corrupted politicians and the situations, mind games that take place in the country. Several veteran Tamil actors essayed pivotal roles in NOTA and Mehreen played the female lead. On the whole, NOTA is one more different film from Vijay Devarakonda and the theatrical trailer strikes hard keeping up the expectations high on the movie. Studio Green bankrolled NOTA and the film will release on October 4th in Telugu and Tamil languages.